Ideal for family businesses or groups of friends working together, this partnership agreement provides a good framework for setting out how the business will be run. It is slightly less formal than our standard partnership agreement, but still includes the provisions small businesses need. 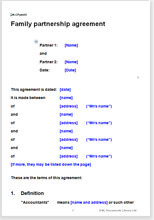 This partnership agreement has been drawn for people working in business together who simply do not need the “bells and whistles” of the very full version we also offer - most likely because there is greater trust between partners. However, we must make clear that this is not a basic or cut down version. This document has been professionally drawn to protect your interests and to provide a really useful commercial framework for your work together. The law relating to partnerships is very basic indeed. It doesn't reflect how modern day partnerships operate. A good agreement therefore should not only improve on the default provisions, but also include paragraphs that set out in greater detail how your business will work. Many families or groups of friends enter into business with each other without a formal agreement because they feel that there is no need to formalise the relationship when there is a high level of trust between the partners. That is fine - the reason to use a partnership agreement with family and friends does not have to be for protection, but should be to contract out of the brutal default provisions of the Partnership Act. This agreement is ideal for groups of friends working together or for a family business where there is already a high level of trust and co-operation between the business partners. "Dedicated and professional .. the very best service I have ever experienced online." "We found this site ideal for us, as we are just setting up this franchise and this legal contract allows us to get started signing up districts when funds are currently sparse."